Sharon Drew Morgen » How Can I Help You Learn Buying Facilitation®? How Can I Help You Learn Buying Facilitation®? I’ve had such a positive response from you about my new book that I’ve realized I now have to get creative. Well, more creative. For the past 10 or so years, I have only run training programs in corporations, with no ability to help individuals learn the model. Now, so many of you are contacting me and want to learn that I’m starting to think about ways to support you. I’m going to lay out some ideas, but please, send me an email to sharondrew@newsalesparadigm.com if you can think of any other ways. I’m excited to work with you on this: my goal is to create a community of Buying Facilitators. Because Buying Facilitation™ is a skill set, not a behavior (i.e. it’s like learning to play the piano, or learning how to be a good golfer, and reading a book doesn’t quite get you there), and because it’s a decision facilitation model and not a sales model, it’s necessary to learn a few things that we’ve not been taught before. In my corporate trainings, my clients take 5 days of study with me (including 2 days of real-time phone calls with clients and me), and 8 weeks of follow-on coaching. By week 5 of the coaching, they are just completing their skills training, and by week 6 they are already doubling their business. It’s kinda like studying with a fine pianist, or golfer, and being an expert within 6 weeks. Given the results, it’s no time at all. But for some who want 3 quick things to do, I can’t help you become an expert…. 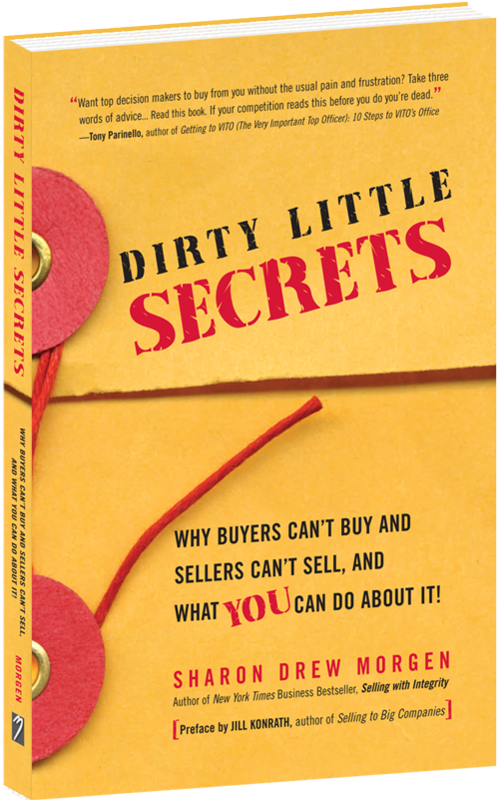 although certainly my new book Dirty Little Secrets will get you much farther along the buying decision cycle than you were before you read the book. For folks who want to learn the model, or even teach/license the model to others, here are the ideas I’ve come up with. And let’s continue this conversation with the new ideas you might have. 1. I have already developed a 26 session Guided Study program for serious learners. It’s 3-5 hours of homework and interactive study in each session, and comes with one coaching session with me. This is for serious students. It took me over 300 hours to develop these learning sessions, and I have carefully calculated your learning arc to make sure everything fits together sequentially so you can learn easily. They take time, they will create real change, and they take dedicated effort – they are not light reading. Real exercises to do. Real homework…. Fun, creative, packed, but homework. And then a lecture. There is a sample of these on buyingfacilitation.com. It’s quite possible to have a group of learners meet with me once or twice a month on-line, and I could answer questions, lecture on the topics of the sessions you’re all on (or we could have a closed group and be going through the sessions together) and discuss places you’re stuck. I’ve got quite a few thoughts on this. Let me know what you think. 2. Start a more casual group for folks who just want help implementing some of the ideas from Dirty Little Secrets. I could give you each one individual coaching session and lay out a strategic plan, and then have an open group that meets monthly, with one topic each month, and 1/2 the time for Q&A. Let me know if you have specific thoughts and needs about this. It’s important to understand that the material in the new book is exciting and innovative, but still demands some new skills re facilitating decisions and delaying the job of sales until all of the stakeholders are involved and ready to move forward (with you on their Buying Decision Team of course). I look forward to hearing from you and figuring out how to best serve you or your team. And thank you again for your interest and excitement in my work. I am honored and touched by your response, and quite humbled that you like the material. Remember: there is one more week in which the freebies are available. Once you buy the book send us your Amazon confirmation and we’ll send out the freebies. For those living outside the U.S., Amazon is not fulfilling non-U.S. orders but we are here, and we’re sending folks the freebies.